dusting off the shelf read-a-thon. 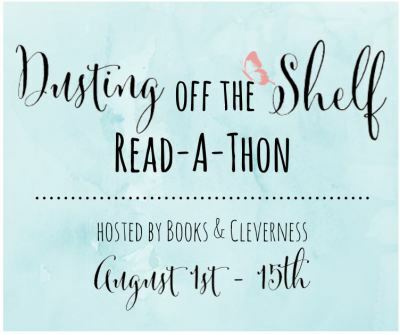 I’m so excited to announce that I will be participating in the Dusting Off the Shelf Read-A-Thon hosted by Emily at Books and Cleverness. This event starts today (August 1) and ends on August 15. The main goal of this read-a-thon is to read books that have been sitting on your shelves for a while, or books that you’ve been meaning to read but haven’t found the time to. Seeing as my TBR pile is basically a mountain at this point, I knew I had to join in! Emily has created some awesome challenges that you can try to complete as part of your TBR for the read-a-thon. I’m not sure if I’ll be able to stick to it exactly, but I’ll definitely try my best to! Read at least 100 pages a day: I’m not sure if I’ll be able to read 100 pages every single day, but I think I can read the equivalent of that throughout the week. So… 1500 pages. I can do that! One that you’ve been neglected: Ready Player One by Ernest Cline. This one is relatively new, but I’ve been meaning to read it since it was released in 2011… three years is enough, right? I know that’s only four books, but I’m leaving the rest of my TBR for the read-a-thon clear for some random picks throughout the next two weeks. I’ve found that I read more when I’m not forced to read a book, so having some freedom to pick books based on my mood at the time will be nice. As far as this blog goes, I plan on using the WWW Wednesdays feature I do every week to update you guys on my progress. Then I’ll do a wrap-up post at the very end to look at how I did overall. For daily and more frequent update I’ll be using Twitter. The handle I’ll be using is @peanutfreeisme, so be sure to follow if you’d like to follow my progress! For more information about this read-a-thon, check out Emily’s master post here. This is my first time officially being part of a read-a-thon, so wish me luck! Will you be participating in this read-a-thon? Do you have any tips for how to be successful in one? Let me know in the comments section below!